May 14, 2018 marks a new chapter in the life of Ava Zinn. But what does it all mean for you and your favourite traditions in Marion or Fort Wayne? As Christiana Danielle was eliminated on The Voice May 9, 2018, the switches were flipped and 35 years of Grant County is done. So forget about Soon to be Fort Wayne’s Very Own LGBT Ava Zinn—as of 3:49 pm May 14, 2018, Yours truly, Aeverine “Ava” Frathleen (Zinn) Nieves, is NOW Fort Wayne’s Very own LGBT Ava Zinn. Friends and fans in both the communities of Marion and Fort Wayne have been waiting for weeks and months watching hours of promotions, posts here on AvaZinn.com, and social media posts touting the move. At the leasing offices of Carey Court Apartments in Marion and Brendonwood Park Apartments in Fort Wayne as well as the Aeverine Zinn Holdings master control rooms in both communities made the final preparations, setting up the feeds, services, making the logs, double checking and triple checking. Boxes and storage totes were packed in Marion, Notices posted. Signs and logos changed. At 12:01 am LGBT Ava Zinn Marion/Muncie signed off for the final time. Then at 10:30 am May 14, 2018 as yours truly made the final bicycle trip in Marion to Riverside Sporting Goods at the 1800 block of North Washington Street, the U-Haul and the delivery person I paid really good money arrived at Carey Court Apartments in Marion loaded, the wires crossed, and at 2:25 pm, the deed was done as residents of Carey Court watched in shock and amazement. At 4:01 PM May 14, 2018, the new Fort Wayne’s Very Own LGBT Ava Zinn posted what I believe is a classic sign on. At any rate, the signs were changed, notices were mailed and sent, the switches were made and what you have been hearing about for almost six years is now a reality–35 years of Grant County is done and new era begins in Allen County. Some things are staying right where they have always been–this web site (AvaZinn.com & Fort Wayne’s Very Own LGBT Ava Zinn), INNewsCenter, Vote for the Girls (United States and United Kingdom), Vape Back! with Ava Zinn, and all other Aeverine Zinn Holdings owned properties and venues. 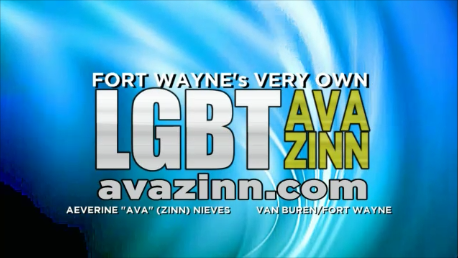 I’ve been a part of Northeast Indiana for 35 years and tonight, I’m honoured to be known as Fort Wayne’s Very Own LGBT Ava Zinn. it is an exciting announcement that was made on February 23, 2018 for not only the city of Fort Wayne, Indiana, but also for the LGBT (Lesbian, Gay, Bisexual, and Transgender) community.